The 50th annual Butterfield Trail Ride is scheduled for the weekend of June 4th and 5th, 2016. We welcome all to attend and help us celebrate and reenact a little bit of the Old West. 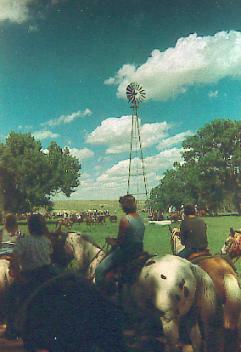 This is an entirely "hay" powered event, riding a portion of the Butterfield Trail along the scenic Smoky Hill River in Kansas. The ride begins Saturday at 1P.M., with a 10 to 12 mile section of the Trail, ending with a stay in Russell Springs for the night. There will be a food concessionaire, but the evening's entertainment will be up to you. Sunday brings a short ride in the morning that will be followed by a Ranch Rodeo brought to you by the Butterfield Trail Riders. You may ride your own horse(stallions not allowed), walk, or possibly catch a ride in one of the wagons if you come early. There is plenty of camping space in Russell Springs , so plan to come and spend the weekend and also visit our museum. The ride is free for all, but donations are accepted on behalf of the Butterfield Trail Museum and Historical Association. There's something here for everyone, both young and old, so please plan to attend. I will be posting more information as it becomes available. If you have any questions, please feel free to contact me at wardtayl@st-tel.net.